My week of eating healthy breakfasts continues. So far I have been doing really well. I have consistently been eating breakfast every morning for the last two weeks and I have noticed that I have more energy and less crabbiness than when I was skipping eating. This week I am visiting family for the week and I am hoping to not eat too much restaurant or fair food. However, I love fair food, so you might notice a few posts on hotdogs and caramel apples on my facebook page, I love them! My two boys have been doing much better than I expected them to with the new breakfast routine and have fallen in love with healthy waffles and whole-wheat couscous. With fair food tempting them this week my main goal is to not have them eat funnel cake and pop tarts for breakfast and at least include eggs or another protein with every meal. I'm pretty sure fried bread does not count as a protein (I wish it would I love those things!). 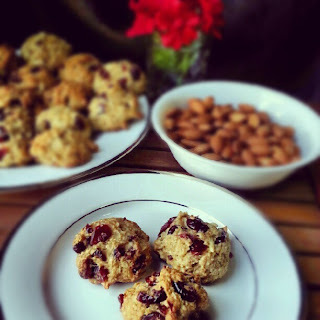 Last week my two boys and I tried a recipe for Almond-Cranberry Quinoa Breakfast Cookies from the January issue of Bon Appetit magazine, which looked like a great compromise between sweet and healthy. This recipe has 15 ingredients. It takes 30 minutes of total time, 10 minutes of which is active and makes 2 dozen cookies. I did make a few modifications. I have been trying to limit the amount of sugar that my two boys consume so instead of granulated or brown sugar I substituted Splenda for baking. Instead of using an electric mixer to beat the sugar and butter, I did it by hand. This sounds bad, but my mixer was dirty and I had no time (or desire) to clean it, so I did the mixing by hand. I did not flatten my cookies out before baking and they turned out less flat and crunchy looking than the photo in the magazine. I would suggest flattening out the cookies in order for them to have the best consistency when baked. I love that these breakfast cookies are full of whole grains. I especially like that they use quinoa, which is a great grain and my two boys love it. Using Splenda for baking worked well and my two boys didn't notice that I didn't use real sugar. This recipe makes a large number of cookies and they lasted for several days. They would also work well frozen, which I often do with cookie recipes. Overall, a nice alternative for breakfast or a snack that is full of whole grains. For the recipe go to Almond-Cranberry Quinoa Cookies.